Spring is finally here on the March 20. As we wait for the warmer weather, let your pet come and spend some time with us at Purr’n Pooch Pet Resorts. We will be hosting our monthly birthday party with a St. Patrick’s Day theme, offering a complimentary bath with the purchase of a 30 day daycare pass, and collecting donations for the rescue, K9 Hero Haven in honor of K9 Veterans Day. 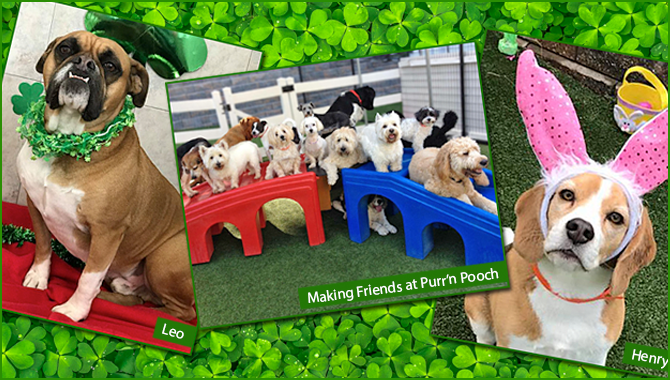 Every paw that joins us to celebrate our daycare friends born in March will be lucky as we search for a pot of gold in a St. Patrick’s Day themed Birthday party. The Easter Bunny is stopping by and leaving treat filled eggs for all dogs who come in for daycare. Please make your pets’ boarding reservations as soon as possible. We want to make sure that we have rooms reserved for all our furry friends. Call for reservations for Tinton Falls at 732-842-4949 and Wall Township at 732-528-8100. Buy a 30 day daycare pass and receive a complimentary bath. This moisturizing shampoo with avocado oil and aloe vera gel helps heal flaky skin and condition dry coats. Package includes shampoo, fragrant spritz, and teeth brushing. Cost is $18 plus price of grooming or bath. Ideally we like all our guests to stay with us at the resort because we are staffed 24/7 and have back up generators in case of power outages, but we understand there can be extenuating circumstances. Learn more on our website or contact info@purrnpooch.com.